baking | What, MORE Muffins??? So, has your Valentine’s Day sugar rush worn off yet? If you were to sneak a peek at the list of chocolate industry-supporting holidays, Valentine’s Day would probably be right up there near the head of the pack. For weeks (since before Christmas in some stores) we’ve been inundated with chocolate hearts in every size, flavor, shape, and color, to the point that they all started to look the same and kind of lost their appeal! (Don’t get me wrong- I like a good piece of chocolate as much as the next girl, but given a choice, I generally prefer my sweets in the form of baked goods.) As the holiday rapidly approached and our household pestilence slowly receded, I realized that it was WAY past time to plan for my holiday baking. Thank goodness for Pinterest! First on the list was my oldest son’s class Valentine’s Day party. Cupcakes, fruit, and all of the other party basics were already covered by the other fabulous room moms, but we have a few kids with allergies to consider, so I usually plan to make something egg/nut/corn syrup-free so that everyone can share the sugar high. My first plan was to bake up some of these Chocolate-Dipped Brownies from Sweetapolita, using egg replacement powder instead of real eggs. I baked up a test batch on Monday morning (I’m still leery of the whole fake egg thing), and they were great! After a day of cutting out PTA Valentine’s hearts, I raced home and threw together a triple batch. That’s when something went tragically and inexplicably wrong, resulting in three trays of very pretty brownies that were hard as bricks on the bottom. (My best guess would be that baking, doing mental math, and negotiating preschool peace treaties at the same time is just a BAD idea and should never be attempted.) By the time that I discovered the problem after an evening of prepping Valentines and cutting out red paper hearts, it was about 3am, so I called it a night and decided to try again in the morning. In a medium bowl, cream butter until fluffy. Add cornstarch & sugar and blend well. Beat in flour until thoroughly mixed. Cool on wire rack & frost with Cream Cheese Frosting. For the classroom cookies, I simply frosted each cookie and added a dash of red sugar. Once that quota was filled, I started to play around with the remaining cookies and decided that I liked them even better sandwiched together with a dollop of frosting in the middle as well as the bit on top! After an afternoon packed with baking, class parties, and WAY more sugar than I should ever consume in a 24 hour period, it was time to grab the kids and run for home so that I could prep our Valentine’s Day dinner. I’d been pondering dessert for a week or so, because I try to do something special each year, and it was a really tough choice! Normally I go for something that’s high on the chocolate level, like a flourless chocolate cake or a chocolate cheesecake, but this year I decided that I wanted something a bit lighter to follow what is inevitably a big meal eaten later in the evening. After careful consideration, I settled on a Chocolate Angel Food Cake recipe that I found in the November/December of Cooking with Paula Deen. (Side note- I JUST received the November/December issue last Friday. GO APO MAIL!) It was a nice, easy recipe to put together, and definitely a departure from our norm. The chocolate taste was subtle, almost overwhelmed by the cinnamon (I’d probably cut the cinnamon in half next time around), but what struck me as odd was the faint taste of coffee when there’s no coffee in the mix! I served it up with a drizzle of chocolate and caramel syrups, a puree of strawberries and raspberries, fresh berries, and both plain and chocolate whipped cream (to make the chocolate cream, just add a dash of Ghirardelli sweetened cocoa powder to the whipped cream near the end). It would probably also be very good with ice cream and hot fudge, or in a trifle with chocolate mousse and berries! In a large bowl, beat egg whites until foamy. Add cream of tartar and salt, and beat until soft peaks form. Gradually add granulated sugar, beating until stiff peaks form. Gently fold cocoa mixture into egg white mixture until combined. Spoon batter into an ungreased 10″ removable-bottom tube pan. Bake for 32-35 minutes or until cake springs back when lightly touched. Remove from oven. Gently run a knife around the outer edge of the pan to release the sides. Remove the cake from the pan by pushing up on the removable base, and then run a knife along the inner edge and bottom as needed to release the cake from the base. Serve with warm Mocha Sauce (or berries, ice cream, hot fudge, whipped cream…), if desired. In a small saucepan, heat chocolate sauce over low heat. Add espresso powder, stirring until dissolved. 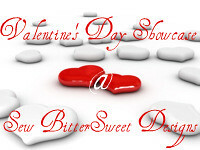 One final note- if you created something special for Valentine’s Day, head on over to Sew BitterSweet Designs for the Valentine’s Day Showcase link party! Melissa has thrown the floor open to her readers, and three lucky winners will win some fabulous prizes for linking up to their Valentine’s Day creations. Definitely too good to miss! Break out the PMS Cookies! We’re still battling the ‘everyone’s sick, so anything complicated is unappealing’ cooking funk, but after I read Lisa’s Dark Chocolate Cupcakes with Dark Chocolate Cinnamon Buttercream recipe in the Valentine’s Day Showcase this afternoon, I knew that something had to be done to get me past the intense chocolate craving that resulted. After some deep contemplation (it’s amazing how much deeper everything seems when you have enough cold medicine in your system), I remembered something wonderful: I have frozen cookie dough!!! Frozen cookie dough is a wonderful thing! Preheat oven to 350*. Wait impatiently for oven to heat and butter to soften. Yell at German oven that takes forever to heat and never does what you want it to. Beat butter, sugars, and peanut butter at medium speed with a heavy duty mixer until creamy. Defiantly lick peanut butter off the measuring cup, just because you can. Add eggs and vanilla, using more force than is really necessary on the eggs and making a mess. Beat until blended. Combine flour, baking soda, and salt in a small bowl. Gradually add to butter mixture, beating just until blended. Get a face-full of flour when you accidentally turn the speed up too high. More yelling. Bake at 350* for 10-14 or until desired degree of doneness (okay, we’ve already established that they’re good RAW…) Note: If you’re using frozen dough, they’re going to probably take a little bit longer than normal- just keep an eye on them and play it by ear. Remove to wire racks, burning mouth in the process while trying to sample the finished product, and cool completely (about 15 minutes). Tell child that they’re ‘mommy cookies’, and boys don’t like them (well, he probably wouldn’t…)! Eat smeared with additional peanut butter, possibly with a side of Swedish fish depending on just how bad the hormones hate you this month. Ready for the oven! Please note: I was good, I only made a dozen of these tonight!